Strokes can happen at any time - including at work - so help your people recognise the signs of a stroke and know to take action FAST. You can download posters for your workplace, use an image on electronic or social media, and/or share a video showing your people what a stroke looks like and that they need to get that person medical attention immediately. Choose from resources below, or see the Health Promotion Agency campaign page for more ways you can share the FAST message. 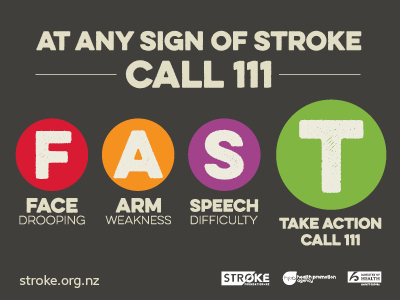 For more information about strokes and how to help someone having one, see the Stroke.co.nz website.